This guide aims to give first time runners of the 14km City 2 Surf fun run from William St in Sydney to Bondi some basic tips which will help them be better prepared and enjoy the day along with the other 85,000 entrants. City 2 Surf live TV coverage is available on Channel 10 and One HD from 7.30-9.30am on race day. The City 2 Surf fun run was initially inspired by the San Francisco Bay to Breakers run in 1970. Since the inaugural run in ’71 which attracted 2000 runners the race has grown in popularity to be Australia’s largest fun run and is a yearly Sydney institution on the second Sunday in August. In 2006, for the first time in the event’s history the number of women entrants outnumbered men in the record capacity field of 63,451. It is truly a community event attracting entrants from all walks of life and all ages. 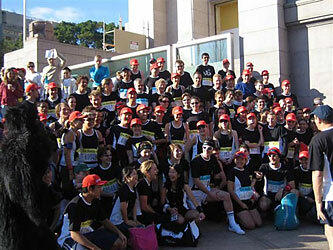 In 2011 the City2Surf’s unique community spirit will, for the 5nd time be channeled into a giant charity fund-raising drive where entrants can fundraise for their favourite charity. Each year the raise several million dollars for the City2Surf Charity Challenge. Red Bibs – is restricted to professional athletes and those who ran in less than 70min in last years City 2 Surf or under specific cutoff times for the SMH Half marathon, Run4Fun, Sun Run and selected Australian Running Festival events. Green Bibs – those who ran in last years City2Surf in less than 90 min. Blue Bibs – Semi-serious runners who’ll probably finish in less than 120 minutes and don’t want to be slowed down by the really slow runners and walkers in slower groups. Yellow & Orange Bibs – People who want to do the run for fun by themselves or in a family group with children etc, probably walking most of the way. For the 4rd time in 2011 everyone in the City2Surf will get a Timing Chip. This means you’ll get an exact accurate finishing time from when your feet cross the start line sensors until they pass the finish line sensors at Bondi. The chip will be posted to you with your chest bib or if you registered late you can pick it up at The City2Surf Expo, you will receive an E-ticket via email that you will need to print out and bring along with you to collect your race pack. AS FAR AS I KNOW YOU CANNOT PICKUP YOUR BIB OR TIMING CHIP ON RACE DAY SUNDAY AUGUST 14TH. If you lose or damage your bib or bib tags you can buy a replacement from the race expo for a fee until the day before the race. The following tips were written by Michael Berry owner of Vivos Active, Personal Trainer and Marathon Runner. In order to decide how to get ready for the event you need to know what your goal is and then based on that goal which group you should be in. Once you have set the goal train to achieve it. When you are setting your goal it is important to understand what it will take in terms of training, nutrition, health support, equipment, (very importantly) time and what condition the race will leave you in. You may decide that you are setting a goal for this year and a better one for next year. 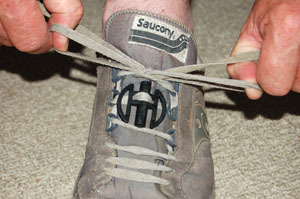 Time to get ready is often overlooked in event preparation, time for the body to lose weight, strengthen muscles, improve blood work, increase bone density, improve posture, and make time in your busy work / home life to do all the training to cause all these changes in the body so that you can run faster for longer. Once you have a realistic goal you need to enter the group that aims to finish the race in the time that you want so that you don’t get held up by other participants. Being in the appropriate group you are more likely to find people moving at your speed to motivate you to keep going or to chase and move faster. Remember that it is a long race, don’t get caught up in the hype at the start, ease into the race and build up to your cruise speed. If you want the goal you have to train! So many people register, set a goal and then don’t do anything, train only a handful of times or worse hurt themselves by taking on too much too soon. NSW Health advises that anyone including those training or participating in the City2Surf, who is unwell with influenza-like symptoms (including fever, chills, sore throat, cough, tiredness, muscle aches, headache or shortness of breath) close to City2Surf race day should stay at home and avoid close contact with others until their symptoms are gone. People who are unwell in the few weeks prior to race day for any reason are strongly advised to re-assess their participation in the event and should talk to their doctor if they have any questions. It is important for all participants to remember to properly hydrate with fluids before, during and after the race. August weather can be unseasonably cool or warm and all participants and spectators should dress appropriately for the conditions. Unlike cotton, many synthetic fabrics will dry quickly and keep you warm when wet. I suggest that you arrive at the City2Surf starting area next to the Australian Museum opposite Hyde Park by 8AM at the latest. My result as a first time entrant with a reasonable amount of preparation was 1 hr 57min 6 sec starting from the back of Group 4 (Back of the Pack start). If you’re catching a bus to the City 2 Surf make sure it stops at Hyde Park. If you’re catching a train you can get off at St James station for the “Back of the Pack” or Museum station for the Blue bib start. Green/Red bib runners can get off at either station. Whichever group you’re starting in try and get to your start line one hour before the race starts (8 am). If you haven’t trained properly for at least 1 month beforehand (preferably 2 months or more) or you’ve been ill in the fortnight prior to the race than take it easy and just walk/jog at a slow pace. If you push yourself too far you could easily injure yourself or get sick from over-exertion. You can collect your medallion to prove you finished and your free copy of the Sun Herald newspaper. Sounds like a must place to be. I hope I can get into hte blue bib group though. Would hate to be in the last group. Afraid that I’d have a hard time qualifying for the yellow bib. Good luck in your quest for the coveted blue bib. Wow, i used to live in Sydney and think i ran this race in 1987 if i not mistaken, brings back old memories of my days in Australia . the city2surf is a great day for everyone who participates and really makes an impact on your life. i encourage people to get involved. Sounds like heaps of fun. Is there any other way to enter this years race since I missed out on the entry. Thanks in advance. You could still run unofficially and time yourself if you want to. Holy cow i just looked at your album, and i think i SEE ME! in the queue for the toilets! Im entering this year! 2009… back of the pack for me and my group of ladies, raising money for the breast cancer network australia! cant wait! its going to be fun. and thanks for the tips, very helpful. What was your training schedule like last year in terms of number of runs per week and distance? This year is my first time to enter. I’m doing 3 days a week. One day is distance building starting at 4km ramping up to 14km (hilly terrain), one day short fast 5km, one day about 2/3 of the distance day with intervals. well, I’m impressed at your taking part in this event. I was going to go running today… but frankly, it’s FAR too cold. Can’t wait for the race! What time would you recommend getting to Hyde Park to make it to the front of the ‘back of the pack’. I’ve been training with the aim to run it in under 90 mins but couldn’t register in any other group because I didn’t have any certification of having done any races before, despite having done many 10k runs overseas. Do you reckon 8am would be a good time to make it to the front? Thanks for that. I didn’t know about the blue start. I emailed City 2 Surf and they said if I didn’t have certification the only group to join was the yellow one – I guess the blue group must’ve been closed at that stage! Ah well, I’ll get there early and do my best.. Should be a fun day anyway. well I dont know how I got to be here! nearly 50 one stone overweight never exercised in my life and some goose has sought fit to enter me in the city to surf? what the..? anway have been googling for tips on how to survive and only found this blog at all useful…God help me cause I dont think reading tips is gonna do it! Have fun everyone and if you see an exhausted small blond fat nearly 50 year old female, splat on the ground somewhere along the way…please have pity! Hi I have been building up for this run all year after being very sick last year . I am 44 , have had 6 children and was very determand to run. I did realize there was an entre date cut off . Is there anyway I can enter now or still run? If so can I run with the blue bibs ? I have found some people who are running in this group . So can you not run anyway? Surely this is open to all/on public roads? I too missed the entry date (don’t ask, I wasn’t organising it). hey so I think you answered this but just want to make sure – I haven’t entered, but if I rock up with my friends who have, is there anyone to stop me from running? This year I qualified for second group (green). Even in that group I had to dodge my way through people until hbh. Took 40 minutes to get half way and then crowds started to thin and took 35 minutes to do second half. If you want to run, definitely get there no later than 8am and get near the front, no matter which group you are in. I was on here before the race asking advice about getting to the front as I registered in the back of the pack. I got there about 8.10 and was about 20 metres from the front of the group. I was still ducking and diving for the whole run but managed 85 minutes which I was happy enough with considering the zig zag route I took! Fantastic day though and fantastic race.. I thought the organisation was just brilliant and the support along the route was outstanding. I’ll definitely be doing it again next year. EDITOR: if you’ve been unwell recently its better to take the race easy rather than risking collapse! We’re from Perth and Sydney City to Surfer virgins! We have different goals, me sub-70mins and my wife to finish – bet she beats me! This year I found some people to run with and were really nice people who brought a feeling of friendlessness to the event which helped me keep my cool made a big difference to the last time i participated. Well, I’m impressed that you attend the event. I like to run… But frankly, this is too cold. when did registration close!!?? am i still able to run to raise money for my chosen charity if im not officially registered?? i have to do this run..
EDITOR: If you are registered but have misplaced your bib, *limited* numbers of replacements are available from the race expo for a $20 charge until the day before the race. You’ll need your e-ticket and valid photo id with you. “If you were unable to make it to the Expo, you will be able to collect your pack tomorrow morning from 6am with your e-ticket. Please arrive early as there will be queues. If you have misplaced your race pack, a replacement can be organised in the morning for a $20 fee. (Limited numbers). Being a first time City2Surfer I’m not quite sure about the baggage drop off for Yellow start. I know its at Hyde Park Barracks and the cut off is 7.30am but they are recommending that Yellow starters not do use the baggage drop off. Not sure why? Is there usually a really long queue? Should I get there before 7am to drop off my bag. Can’t run with a back pack. Thanks Hamish, unfortunately, living so far away, I didn’t want to risk going and not being able to run, so I stayed home – this information would have been handy on the website…. maybe next year. Does any one know how I can register to enter the run?